Newly renovated in 2019, this 5 bedroom 3.5 bath second row home features two complete living levels, each with separate living and dining areas, kitchens and laundries. There is a large TV in each living area, as well as TVs in all bedrooms. WiFi is also provided throughout. The lower level has a large great room and three bedrooms. One bedroom has a king, one bedroom has a queen and the third has a full bed with an attached half bath. The great room includes a full size sleeper sofa. This level also has a full bath with a large glassed in shower with 2 separate sinks. A large sliding door leads from the great room to an outside landing zone, complete with pergola and hot/cold outdoor shower. On the other side of the lower level is a large screened porch with a gas grill, hammock, ping pong table and a fish cleaning station. The upper level has a queen bedroom with a private bath with glassed in shower. Another very large bedroom holds two sets of bunks that sleep a total of six. (One is a pyramid bunk with a single over a double and a trundle underneath and the other is a single over a single). The room also has a TV lounge spot with seating. This bedroom has a full bath with double sinks and a large jetted tub. The upper level living area has a queen size sleeper sofa. 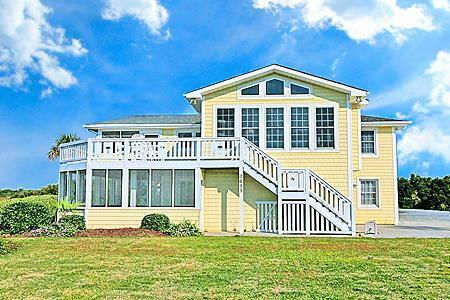 There is a large sunny deck off the upstairs living area, and a screened porch with a view of the marshes. For enjoying the outdoors, the private beach access (shared with the home on the sound side) is directly across the street. There are a private shower and beach equipment locker at the access stairway. Additionally, there is a private pier and dock on the sound side for fishing and kayaking. As this is also shared with the sound side home, access to the pier is by easement on the south side of the home – not down the driveway. This updated home contains many enhancements to make your family vacation a comfortable and pleasurable one. Its two separate living areas make it ideal for two families. Up to 2 dogs (only) allowed only with a $175.00 per dog, non-refundable fee.